This section is from "Every Woman's Encyclopaedia". Also available from Amazon: Every Woman's Encyclopaedia. The girl who has been accustomed to plenty of room in her parents' home often brings rather large ideas to the furnishing of the tiny flat in which she is to begin her married life. The majority of small houses and flats are uncomfortably overcrowded, but it is not until one has been cooped up for a week, recovering from illness in a little room in which there is scarcely space to turn round, that one realises their full inconvenience, and longs for a little free space in which to take a few steps backwards and forwards. It is wonderful, however, how much extra elbow room can be contrived by a judicious use of folding and composite furniture. Let us suppose that our young couple have taken a six-roomed flat, two of the rooms being assigned to the maid as kitchen and bedroom. That leaves four rooms to dispose of, two of which they will probably make into sitting-rooms and the remaining two into bed and dressing room, the latter being used as a spare room when required. One of the sitting-rooms will, perhaps, be very small, and this they will keep for meals, furnishing it only with table, sideboard, and chairs, reserving the larger apartment for a living-room. A very common mistake is to fill up almost the whole of a little dining-room with a solid table. But it is very much better, and also cheaper, to have a collapsible table that can be neatly folded together when meals are over, and either placed against the wall, or removed from the room, leaving a free floor space, so that armchairs can be drawn up in front of the fire. 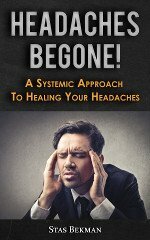 An apartment with a dining-table pushed back against the wall, to make room before the fire, has a disorderly and uncomfortable look, and anyone moving to get a book or leave the room generally has difficulty in squeezing past. Another advantage of the folding table is that it can be taken into the larger room if it is sometimes desired to have meals there. A young couple marrying on a small income may not feel justified in keeping two fires burning every day, and will probably prefer to have the fire in the room which contains their most cherished household possessions. This room, also, may be fur nished with a folding table. A small one, suitable for afternoon tea, is obtainable at very small cost. Dining-tables with legs that fold up lightly against the side are made in all sizes from 3 feet by 2 feet 6 inches to 6 feet by 3 feet, prices varying from about IIs. to £l. With a cloth over them they have quite a good appearance, though as they are only used at meals, their appearance is of secondary importance. Folding chairs can also be obtained, but perhaps these are hardly sufficiently comfortable for ordinary use. Returning to the dining-room, the only important item of furniture, besides the table and chairs, is the sideboard. Remembering that it may be necessary later on to turn the dressing-room into a nursery, it is well to make some provision for making this room occasionally into a sleeping chamber, in case of illness, or if it is desired to put up a member of the family for a night or two. A combined sideboard or secretaire bed can be obtained from about £8 to £15 upwards. This is a very neat piece of furniture, the front exactly like any ordinary sideboard. The bed, made up all ready for use, is stowed away at the back, upside down, and when required the sideboard is simply turned round, moving very lightly on castors, and the bed lowered. If there is space in the room a combined davenport and washstand is very convenient, the price being from £3 10s. to £4 10s., but, of course, almost all modern flats are furnished with bathrooms, so that a washstand for an emergency bedroom is hardly necessary. In the drawing-room the only chance of space saving is to have small furniture, and not too much of it. 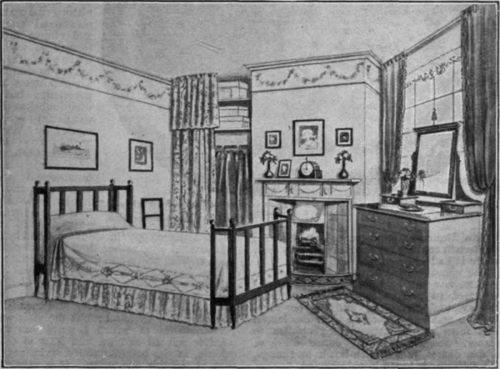 Unless, indeed, it is preferred to make this, rather than the dining-room, into an emergency bedroom, in which case a very elegant little sofa can be obtained, the back of which lets down by means of hinges when required as a bed so that the clothes can be comfortably tucked up beneath the nice hair cushion, which is supported on a wire-wove frame that makes it delightfully springy to sleep on. In the bedroom there is plenty of scope for space saving. 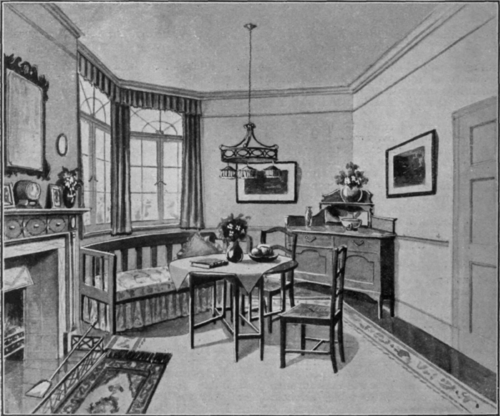 It is extremely uncomfortable to have to dress in a very confined space, so that one has to be constantly on guard against bumping into some piece of furniture, yet most young couples seem to think they must have a complete bedroom suite, with wardrobe, chest of drawers, toilet-table, and washstand, however small this room may be. A wardrobe takes up a great deal of space, and is little or no gain to the room from the point of view of appearance. If there is no cupboard it is much better to fix a row of hooks against the wall in a recess (or in a corner if there is no recess) to take one's everyday clothes, a curtain being hung in front to keep them free from dust. A wooden top should be fixed in this improvised wardrobe, to the under side of which hooks may be attached on which coat-hangers can be suspended. Above the top of the cupboard shelves can be fixed all the way up to the ceiling, and similarly covered with a curtain, articles being kept there which are not frequently used. Such shelves are very useful for packing away (in brown paper or shallow boxes) one's summer wardrobe during winter, and vice versa. Clothes can also be packed away conveniently in an "under-robe" - a long wooden box on castors, which slips away under the bed, and is pulled out easily for dusting. A solid, well-made box of this kind can be bought for under £1, or if the husband is a handyman, he might make one himself. The great point is that it must be on castors, so as to move readily. The toilet-table may be combined with a chest of drawers, or a very pretty dressing-table, chest of drawers, and washstand combined can be obtained for about £4, fitted with a towel-rail at one end, so that everything is complete. It must be remembered that every solid piece of furniture takes away from the air space and makes the room less healthy to sleep in. Useful beds for a small room are the "Bat" and the "Bee," both of which can be transformed in a few moments from a single to a double bed by means of ingenious hinges and unseen folds. A little detachable cot for a child can be attached to the side of one of these beds and can be folded up when not in use. There are several other light collapsible cots in the market. Another useful bed, for emergencies, is the crush-up, which can be transformed into a neat little stand when not in use. For a gentleman's dressing-room, an ottoman couch, which can be converted into an emergency bed, is very convenient, the inside being used for keeping clothes. A washstand with shaving-glass attached saves a dressing-table, or a combined wash-stand-chest of drawers may be used, the shaving-glass being hung above it. This arrangement should leave ample space for morning dumb-bell exercise, however small the room may be. The importance of using wall space in economising room should not be overlooked. Of course, it is not desirable to spoil our walls by overloading them with pictures, or shelves for pretty, useless trifles, which only serve to accumulate dust or add to the work of the maid-servant or mistress, but a corner cupboard fixed in each bedroom will be found a boon for holding medicine-bottles and the like, or, in a sitting-room, for various odds and ends that are unsightly yet necessary. A small bookshelf, too, in a room is an acquisition, and should be placed within comfortable reach, and used only for books and papers.